If you notice that you have excess earwax buildup, the best thing to do is contact an audiologist to take care of it. Taking care of earwax buildup feels like a standard part of personal hygiene. You grab a Q-tip and get it out of your ear. However, it can be much more tricky to properly deal with than you may actually realize. You need to watch how you take care of your earwax buildup, and try to avoid dangerous practices because they can very easily result in hearing damage. In order to properly handle earwax buildup, follow these tips and remember these facts. Q-tips and cotton swabs are most commonly used to deal with earwax buildup, but they are not always the right option. If anything, they should only be used on the outer part of your ears and should otherwise not be used. There is not much space in your ear for Q-tips to maneuver in, so when you use them to try and clean up your earwax buildup, you are usually just pushing the earwax further back into your ear, causing the problem to worsen. This can also cause impaction which can prevent you from hearing sounds properly. Additionally, you can also damage the tiny bones in your ear with cotton swabs, causing you to need emergency surgery. So, when dealing with earwax buildup, it is best to be careful with how you use Q-tips and cotton swabs. Many people think that earwax buildup can effectively be dealt with ear candles, but professionals disagree strongly with this. The flame coming from the candle you are placing next to your ear dealing with this earwax buildup can very easily burn your ear or even your eardrum. The wax is better off left alone and not dealt with than using a candle to rid of it. If you choose to use an ear candle, you can also very easily injure yourself with the wax from the candle while also having to deal with the numerous fire hazards that come with this method. The best person to help you handle earwax buildup is to consult a doctor about it. 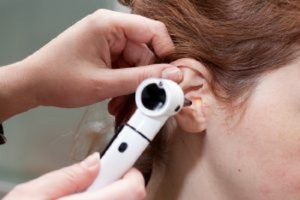 If you are unable to properly deal with it yourself or it becomes irritated over time, then you will need a doctor to help you deal with the earwax buildup. Your doctor can use a variety of methods to clean your ears, while also being able to handle and deal with whatever issues you may have with your ears or earwax buildup. This entry was posted on Friday, August 10th, 2018 at 4:28 pm. Both comments and pings are currently closed.